Take the guessing out of pipe maintenance and rest assured that even on the coldest winter days, your pipes will continue to flow when installed with automatic controls for freeze protection. 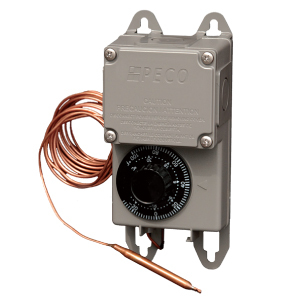 Warmup offers a selection of controls for freeze protection to suit your project. When to use the TF115-005 controller? Designed perfectly for small and medium-sized jobs, the TF115-005 Controller will provide protection to pipes, ducts and sprinklers to prevent the destructive effects of burst pipes. The TF115-005 Controller is in a rugged, weather resistant enclosure, enabling placement most anywhere. It mounts near or onto the pipe or duct for accurate monitoring. It has a large, visible dial, allowing for easy & simple control of set points. Read Specification sheet.